People from all age groups and all walks of life consult social workers. 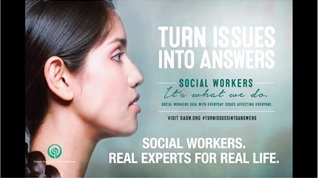 Social workers provide services to individuals, couples, families, groups, communities and corporations. "Social Workers. Turn Issues into Answers" #TurnIssuesIntoAnswers; #RealExpertsForRealLife. Social workers help identify the source of stress or difficulty, help people to develop coping skills and find effective solutions to their problems, offer various forms of counselling and therapy, and mediate between conflicts. Many social work positions are funded directly or indirectly by governments (municipal, provincial or federal). Other social workers work for agencies funded by voluntary donations. A growing number of social workers are independent or private practitioners.